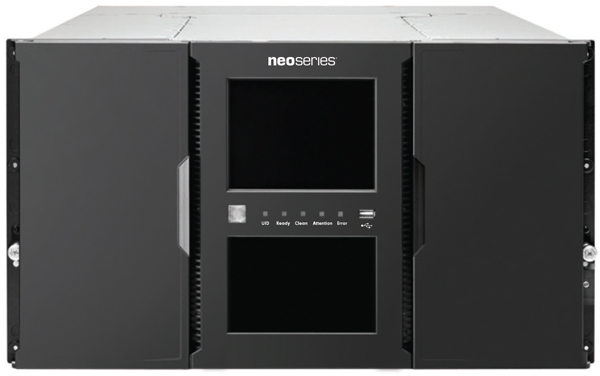 Designed for enterprise applications experiencing rapid data growth, the NEOxl 80 delivers the ideal combination of features and functionality aimed at reducing the overall cost of your long-term data storage solutions. max. native data transfer rate per module 1.7 TB/hr. 1.5 TB/hr. 3.5 TB/hr. 3.0 TB/hr. 3.5 TB/hr. 3.0 TB/hr. max. compressed data transfer rate per module 4.3 TB/hr. 3.0 TB/hr. 8.6 TB/hr. 6.0 TB/hr. 8.6 TB/hr. 6.0 TB/hr. H x W x D 10.6" x 18.7" x 35.1"
268mm x 475mm x 892mm 10.6" x 18.7" x 35.1"
Rack height 6u per module; 42u max. 6u per module; 42u max. 6u per module; 42u max.